John Sullivan operated an antique shop in a rambling old frame house on lower Main Street, just south of the stone building that previously housed Mixter's blacksmith shop. The 12-room building, also his home, was chock full of furniture and bric-a-brac of various vintages, which he garnered from area residents anxious to convert their cast-offs to cash. With much of his merchandise sitting on the porch or along the sidewalk, the shop proved irresistible to passing tourists, and was described in an article in the October 1946 issue of the nationally circulated Ford Times. Sullivan had been a used furniture dealer in Glens Falls. According to the late Ed Kreinheder, a friend and business associate, he had a good sense of humor and enjoyed a good joke. Born before the turn of the 20th century, Sullivan died in his eighties. His building was demolished sometime in the late 1960s. 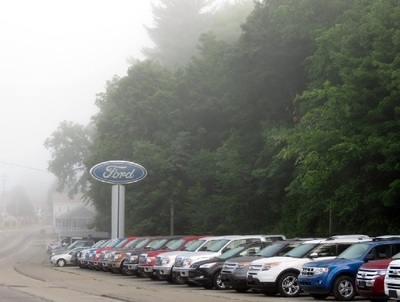 The property now is a display lot for the Warren Ford dealership.